Season 6, Episode 8 - "Chapter 73"
Season 6, Episode 7 - "Chapter 72"
Season 6, Episode 6 - "Chapter 71"
Season 6, Episode 5 - "Chapter 70"
Season 6, Episode 4 - "Chapter 69"
Season 6, Episode 3 - "Chapter 68"
Season 6, Episode 2 - "Chapter 67"
Season 6, Episode 1 - "Chapter 66"
Season 5, Episode 13 - "Chapter 65"
Season 5, Episode 12 - "Chapter 64"
Season 5, Episode 11 - "Chapter 63"
Season 5, Episode 10 - "Chapter 62"
Season 5, Episode 9 - "Chapter 61"
Season 5, Episode 8 - "Chapter 60"
Season 5, Episode 7 - "Chapter 59"
Season 5, Episode 6 - "Chapter 58"
Season 5, Episode 5 - "Chapter 57"
Season 5, Episode 4 - "Chapter 56"
Season 5, Episode 3 - "Chapter 55"
Season 5, Episode 2 - "Chapter 54"
Season 5, Episode 1 - "Chapter 53"
Season 4, Episode 13 - "Chapter 52"
Season 4, Episode 12 - "Chapter 51"
Season 4, Episode 11 - "Chapter 50"
Season 4, Episode 10 - "Chapter 49"
Season 4, Episode 9 - "Chapter 48"
Season 4, Episode 8 - "Chapter 47"
Season 4, Episode 7 - "Chapter 46"
Season 4, Episode 6 - "Chapter 45"
Season 4, Episode 5 - "Chapter 44"
Season 4, Episode 4 - "Chapter 43"
Season 4, Episode 3 - "Chapter 42"
Season 4, Episode 2 - "Chapter 41"
Season 4, Episode 1 - "Chapter 40"
Season 3, Episode 13 - "Chapter 39"
Season 3, Episode 12 - "Chapter 38"
Season 3, Episode 11 - "Chapter 37"
Season 3, Episode 10 - "Chapter 36"
Frank needs to deal with Petrov one on one, while Claire tries to preserve the peacekeeping mission. Sacrifices must be made. Season 3, Episode 9 - "Chapter 35"
Season 3, Episode 8 - "Chapter 34"
A hurricane endangers more than just the entire East Coast, and Frank must make a difficult choice. Season 3, Episode 7 - "Chapter 33"
The damage is done, and the Underwoods must repair it. But deep wounds don't heal fast and sometimes not at all. 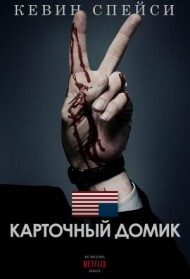 Season 3, Episode 6 - "Chapter 32"
Season 3, Episode 5 - "Chapter 31"
Season 3, Episode 4 - "Chapter 30"
Season 3, Episode 3 - "Chapter 29"
The Russian President's state visit becomes a Cold War of wills and some punks heat things up. Season 3, Episode 2 - "Chapter 28"
Season 3, Episode 1 - "Chapter 27"
Season 2, Episode 13 - "Chapter 26"
Francis faces annihilation in the Season 2 finale. Meanwhile, Stamper ties up loose ends; and Claire feels the repercussions of ruthlessness. Season 2, Episode 12 - "Chapter 25"
Francis finds himself shut out. Later, Claire makes a difficult sacrifice; and Stamper tries to regain control. Season 2, Episode 11 - "Chapter 24"
Francis is interrogated. Meanwhile, Stamper wrestles with personal demons. Season 2, Episode 10 - "Chapter 23"
Francis tries to finish off Tusk for good. Later, Claire and Jackie Sharp collide. Season 2, Episode 9 - "Chapter 22"
Season 2, Episode 8 - "Chapter 21"
Claire influences Tricia Walker politically and domestically. Later, Francis has a showdown with Linda Vasquez. Season 2, Episode 7 - "Chapter 20"
The Walkers deepen their friendship with the Underwoods. Season 2, Episode 6 - "Chapter 19"
Francis and Tusk end their alliance. Meanwhile, Lucas must make a difficult choice; and Stamper grows closer to Rachel. Season 2, Episode 5 - "Chapter 18"
Lucas goes to extreme measures to expose Francis. Season 2, Episode 4 - "Chapter 17"
A terror scare at the Capitol traps Francis with a resentful Donald Blythe. Meanwhile, Claire gives an attention-grabbing live interview. Season 2, Episode 3 - "Chapter 16"
Tensions rise between Francis and Raymond Tusk. Later, a battle in the Senate pits Francis against the Republicans. Season 2, Episode 2 - "Chapter 15"
Francis targets China. Meanwhile, Claire confronts a painful trauma from her past; and Lucas Goodwin presses for the truth. Season 2, Episode 1 - "Chapter 14"
The Underwoods face two threats in the Season 2 premiere. Later, Francis grooms his replacement; and Claire goes on the offensive. Season 1, Episode 13 - "Chapter 13"
Francis desperately tries to keep his plan on track in the Season 1 finale. Later, Claire suffers the consequences of her decisions. Season 1, Episode 12 - "Chapter 12"
Francis takes an unexpected detour. Season 1, Episode 11 - "Chapter 11"
Peter battles personal demons; Francis enters dangerous territory. Season 1, Episode 10 - "Chapter 10"
Claire defies Francis; Peter presents an ultimatum. Season 1, Episode 9 - "Chapter 9"
Francis and Stamper seek support in Congress. Season 1, Episode 8 - "Chapter 8"
Francis receives an honor; Peter returns to Philadelphia. Season 1, Episode 7 - "Chapter 7"
Francis wins a major victory; Peter faces his past; and Stamper attempts to bury a secret. Season 1, Episode 6 - "Chapter 6"
Francis battles striking teachers; Claire receives a surprise confession. Season 1, Episode 5 - "Chapter 5"
Francis' fight over an education bill creates unfortunate side effects. Season 1, Episode 4 - "Chapter 4"
Francis takes on leaders in Congress; Peter Russo is forced to choose between politics and family. Season 1, Episode 3 - "Chapter 3"
Francis deals with a crisis in his home district; Zoe experiences the politics of journalism. Season 1, Episode 2 - "Chapter 2"
Francis attacks the White House through the media; Claire makes a cruel decision. Season 1, Episode 1 - "Chapter 1"
Allegiances are abandoned after a promise is broken in the opener of this drama, which follows a ruthless congressman and his equally ambitious wife as they navigate the corridors of power in Washington, D.C.